Samsung’s plan of shaking up its mid-range and budget smartphone lineups has started picking up the pace. A new Galaxy M series of smartphones are expected to replace the current crop of the Galaxy J, On and C series next year. Few weeks ago, we also exclusively reported about two Galaxy M phones that Samsung is working on. We later received exclusive information about a third (and lower-end) Galaxy M device with model number SM-M105F. That device has surfaced on Geekbench today. This follows a benchmark for another of the M series phones (the SM-M205F), which was spotted on both Geekbench and AnTuTu last week. 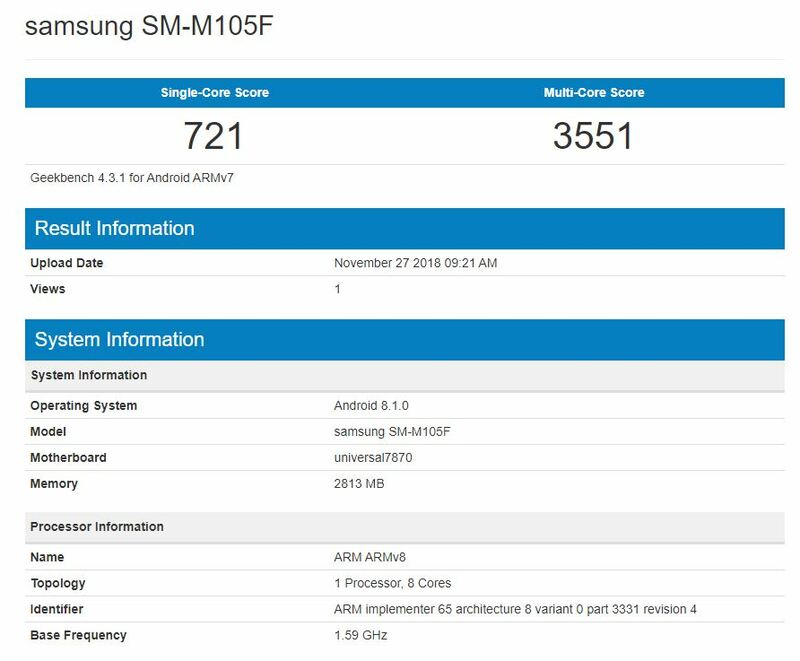 The Geekbench listing for the SM-M105F (possibly named Galaxy M10) mentions an Exynos 7870 processor with 3GB of RAM. It is the same processor Samsung uses in most of its budget smartphones. The SM-M105F will run Android 8.1 Oreo out of the box, and that’s possibly because it will come out before the Galaxy S10, which is obviously going to be the first Galaxy device with Android 9 Pie out of the box. While the Geekbench listing doesn’t reveal anything more about the SM-M105F, we expect it to be available with dual-SIM support. Storage options will include 16GB and 32GB. And since it is a budget phone, Samsung could also opt for an LCD display panel and save some production cost just to revive its struggling smartphone business. Samsung is also working on a new Galaxy A series of budget smartphones. Devices with model numbers SM-A305F and SM-A505F are currently in development. You can read more about the upcoming Galaxy A and Galaxy M phones here.